It's such a busy time of year, but I love baking. It helps me relax, it makes my apartment smell heavenly, and I have treats to share with my friends. I'm sharing my chocolate chip cookie recipe with you so you can put smiles on lots of faces over the holiday season. Preheat the oven to 375°F (190°C, Gas Mark 5). Sift the flour, baking soda, and salt into a small bowl. Cream the butter, sugars, and vanilla in a large mixer bowl. Add the eggs one at a time, beating well after each addition; gradually beat in the flour mixture. Stir in the chocolate chips and nuts. Drop by rounded tablespoon onto ungreased, foil-lined baking sheets. Bake for 10-12 minutes or until golden brown. Let stand for a couple of minutes, and then move to wire racks to cool completely. Two winners will each receive a signed copy of YULE BE DEAD. To enter today's giveaway, please comment your favorite cookie. Please don't forget to add your email address so winners may be notified. Winners will be chosen/announced on Saturday, December 15. Merry Christmas! I hope you all have a blessed holiday season! I think Gingersnaps would be my favourite cookie. Peanut butter and Pecan Sandies are in a close running though! Chocolate Chip cookies will always be my favorite. I always like to try new recipes so my favorite is always changing, but currently it's a delicious peppermint cookies. And brownies are always at the top of the list. We always bake Gingerbread men cookies and I lost the lady gingerbread cutter! It's been a family tradition since I was a kid! I ate the neighborhood kids cookies one year! Boy was my Mother mad! Veronica Boudreau, vboudreau57@gmail.com. Sugar cookies - I remember my mom making them as a kid and we would eat the dough while it was in the fridge. My very favorite cookie is the chocolate chip cookie. They are good any time of the year. Mmm, chocolate chip cookies still warm with melty chocolate. I'm told (but haven't had the patience to do it yet) that cookies like this are even better if you chill the dough for an hour or so. My favorite cookie is my Ozark Honey Oatmeal Cookie. It's great because it just gets better with time. It doesn't dry our or get crumbly. It freezes great and it ships well. Bake 8 to 10 minutes or until lightly golden. 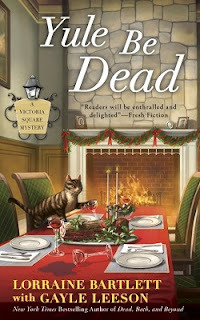 Thanks for the chance to win a signed copy of YULE BE DEAD! These sound wonderful! Thanks for sharing the recipe! Chocolate cookies with chocolate chips. For Christmas, I like the Pepperidge Farms Christmas ones or other store bought cookies. My favorite cookies are homemade lemon bars. Thanks for the chance to win. Happy Holidays to you and yours. A nice chewy oatmeal sans raisins. Yum! Sugar cookies are my favorite cookies. Thanks for the chance to win. I like to try new cookie recipes, but my favorite is shortbread. I'm always trying new cookie recipes, so it's really hard to nail down a favorite. But I think it must be gingersnaps, because if I'm craving a cookie, that would be my first choice. But it must be my Mom's recipe that she cut from a newspaper back in the 1940s, replete with molasses and real butter. I love fruitcake cookies and shortbread. Thanks for a chance to win. I like shortbread and soft chocolate chip cookies in fact almost all kinds of cookies. I do like chocolate chip cookies. My favorite cookies are pecan sandies,snickerdoodles and peanut butter. I love nut cups and eggnog cookies during the holiday season. Thank you for the cookie recipe and opportunity to win your book! Merry Christmas and a very Blessed New Year! Mmmmm, cookies! My favorites are oatmeal chocolate chip, hands down. Email is Lara.Baker at AOL. Thanks for the fun this week! I love chocolate chip, chocolate chocolate chip, And peanut butter. Goodness, I don't think I've ever met a cookie I didn't like. :) This time of year, I do crave homemade frosted sugar cookies with sprinkles. Merry Christmas! We make a mint cookies that is my favorite. The dough is similar to chocolate chip cookie dough without the chocolate chips or nuts. You then wrap a small amount of dough around a round chocolate mint wafer and top it with a small piece of walnut. So yummy! Thanks so much for the chance! My favorite cookies are Snickerdoodles. Thanks for the chance!! Peanut butter chocolate chip cookies 😀. Happy holidays and thank you so very much for letting me enter your giveaway. My favorite is Sugar Cookies with Chocolate Chip coming in a close second! I found a recipe for cinnamon roll cookies that is amazing. Thanks for the chance. Chocolate chip cookies are hard to beat. This year, I found a recipe that adds coarsely crushed white chocolate-covered mini pretzels to the batter. YUM! I also found a new recipe for Orange-Frosted Cornmeal Stars, so they have become a new favorite! I forgot to add my email address to my favorite cookies: dorothyminor10@gmail.com, so I am repeating my favorites! Chocolate Chip cookies are always good. This year, I found a recipe that calls for adding 7 ounces coarsely chopped white covered-pretzel chips to the batter. YUM! Another new favorite is a sugar cookie that adds cornmeal to the batter: Orange-Frosted Cornmeal Stars. They are light and delicious! My favorite for this time of year is peppermint bark, which is not really a cookie but I really like it. Thanks for the chance! I have never met a cookie I didn't like, however chocolate chip cookies are not a favorite (until I start eating them, and then I can't stop!) I love shortbread and butter cookies. My favorite was a cookie my Detroit grandma used to send us each year called snowballs. It is a rich butter cookie rolled in a ball and then rolled in powdered sugar before and after baking. If I only make one cookie at Christmas, this would be it. I love homemade sugar cookies best, but peanut butter cookies are an awfully close second. Especially if they're homemade by somebody else!